High measurement accuracy. Limits of the available error under operating conditions for the mass concentration of alcohol in the exhaled air: absolute error (Δ): ± 0,02 mg/l - in the range from 0 to 0,2 mg/l, relative error (δ): ± 10% in the range above 0.2 mg/l; for the mass concentration of alcohol in the blood: absolute error (Δ): ± 0,04‰ - In the range from 0 to 0,4 ‰; relative error (δ): ±10% - In the range above 0.4‰. Extended (additional) warranty from the distributor for 18 months (only 30 months) - provided that the service maintenance and grading operations are performed once a month for 12 months, and the Verification operations are carried out at a certified service center. Upon access to the certified Dräger service center of Saturn® Data International, the execution of the operations "Grading" and "Checking" of the instruments is carried out at government rates, after the operation "Check" the client is provided with a Certificate of verification of the working means of the state-of-the-art measuring equipment, as well as diagnostics with providing the necessary recommendations and servicing the devices within the package "Complex". If these operations are performed within the package "Complex" at least 1 time in 12 months post-warranty repair is carried out with special discounts. 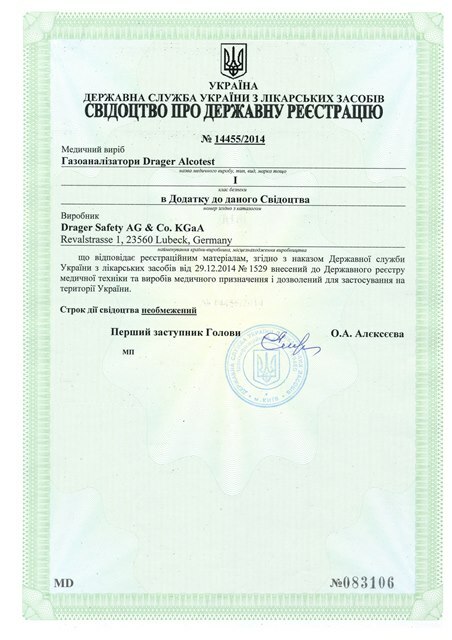 Dräger Аlcotest 6820 has a whole set of necessary Ukrainian permissive documents for implementation as in professional practice and also by traffic police officers, as well as in narcology services, labour protection, security services of all industry branches and private persons. 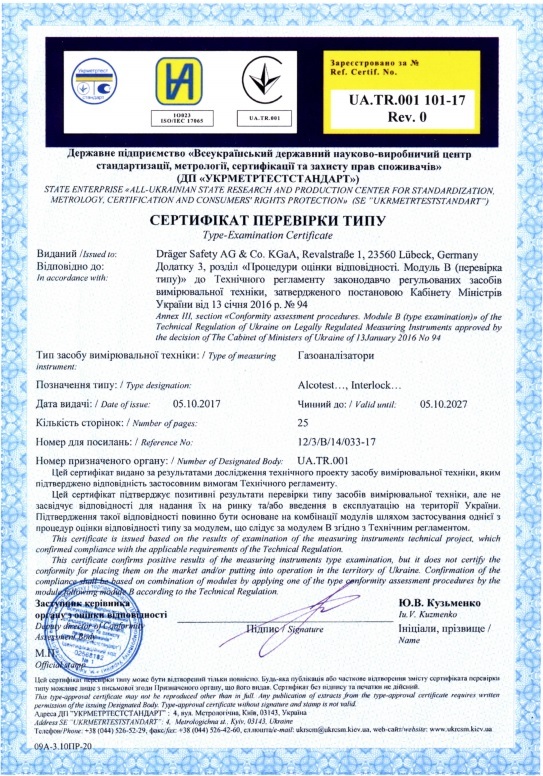 The manufacturer or his authorized representative of the manufacturer must provide a copy of the first page of the Type Verification Certificate in accordance with Module UA.TR.001 101-17 Rev.0 of 05.10.2017. The manufacturer or his authorized representative of the manufacturer must provide a copy of the Declaration of Conformity, drawn up in accordance with the requirements of the current legislation. The manufacturer or his authorized representative of the manufacturer must provide a copy of the Declaration of conformity to the requirements of the Technical Regulation on medical products, prepared in accordance with the requirements of the current legislation. The mark of conformity to the technical regulations and the identification numbers of the designated conformity assessment bodies must be placed on labels, operating instructions, service and warranty books of gas analyzers. The marking must be in accordance with the requirements specified in the Type Verification Certificate under Module UA.TR.001 101-17 Rev.0 of 05.10.2017. The gas analyzer must be sealed in accordance with the Type Verification Certificate according to Module B UA.TR.001 101-17 Rev.0 dated 05.10.2017. The software must meet the requirements specified in the Type-Certificate Verification by Module UA.TR.001 101-17 Rev.0 dated 05.10.2017. Operation of gas analyzers must be carried out in accordance with the manufacturer's operating instructions. Means of protection: a security element "SDI" (seal-label), which collapses when attempting to remove an element from the object of protection. Markings and inscriptions: The mark of conformity and additional metrological marking in accordance with the Technical Regulations should be placed on the service-guarantee books of gas analyzers, as well as in battery compartments. The Service Guaranty must also have a Type Verification Certificate number. Taking into consideration that the Ukrainian Supreme Council has adopted the Law "About Amendments to some legislative acts of Ukraine concerned increased responsibility for driving the vehicles under the influence of alcohol", the presence of own breathalyzer in a car, similar to existing in service in Traffic police units, has become more relevant. About the size of liability has reported LIGABusinessInform news agency. Investing the sum equal to the sum of one penalty, you get a reliable mean to avoid troubles for many years. WORLD LEADER OF SALES FOR MOTORISTS ! New model from Dräger Concern which is expected to be the most popular model among motorists, as it is specifically oriented for private persons. WORLD LEADER OF SALES FOR PASSENGER AND FREIGHT TRANSPORT IN SMALL, MEDIUM AND LARGE ENTERPRISE, MUNICIPALITIES, INDIVIDUALS !!! This is breathalyser that blocks vehicle engine start if alcohol is detected in breath.